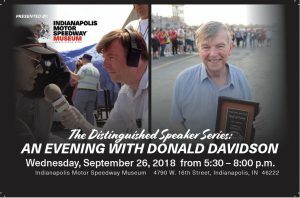 Indianapolis Motor Speedway Historian Donald Davidson will be the honored guest for the IMS Museum’s next “Distinguish Speaker Series” event, scheduled for Wednesday, Sept. 26 from 5:30-8 p.m. at the Museum. 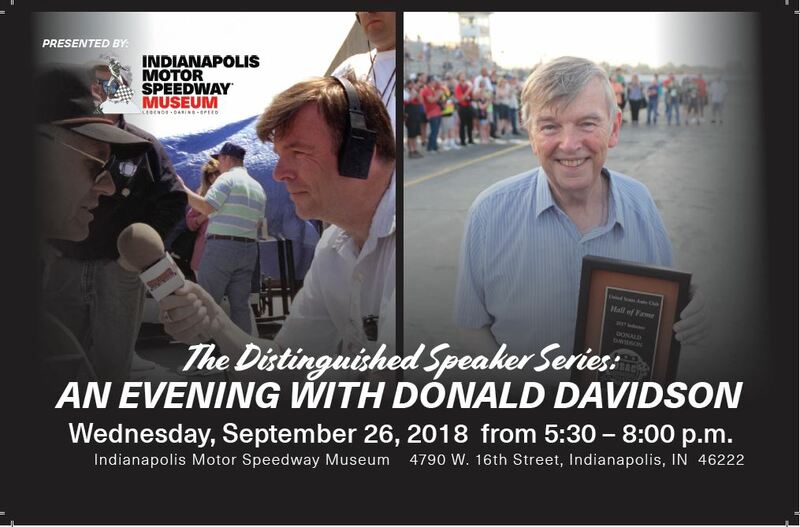 Tickets must be purchased in advanced; order tickets now as the beloved Davidson and his encyclopedic knowledge of Indianapolis 500 history is a popular draw for the IMS Museum’s Distinguished Speaker Series. Tickets for IMS Museum members are $40, non-members pay $55, and the event includes free hors d’oeuvres courtesy of Ruth’s Chris Steak House and a cash bar. Patrons are welcome to sign up for an IMS Museum annual membership to receive the discounted ticket price; memberships include numerous year-round benefits. Doors will open at 5:30 p.m., with food and refreshments immediately available. Davidson’s presentation and question-and-answer session will get underway following introductions at 6 p.m.
To purchase tickets, contact Kelly Hartman at (317) 492-6568 or khartman@brickyard.com. Davidson, a 2010 Indianapolis Motor Speedway Hall of Fame inductee, has been an IMS institution since arriving on the Indy racing scene in 1964. His incredible knowledge of year-by-year Indianapolis 500 driver statistics, along with anecdotal driver and team histories, made him an instant hit and celebrity among the racing fraternity. He went back to his native England after the 1964 edition of “The Greatest Spectacle in Racing,” then returned to the Speedway in 1965 and stayed for good. Soon after Jim Clark won the 1965 race, Davidson was offered a position with the United States Auto Club as statistician and remained there almost 32 years. He was officially named IMS Historian in 1998. In honor of Davidson’s 50-plus years of promoting the Indianapolis Motor Speedway and the sport of auto racing, he was presented with Indiana’s highest civilian award, the “Sagamore of the Wabash,” by then-Gov. Mike Pence in 2016. Future Distinguished Speaker Series events: The featured speaker for the Wednesday, Nov. 7, “An Evening With …” is being finalized, but please put that date on your calendar. A special edition of the Distinguished Speaker Series on Thursday, Dec. 6, will feature Sam Schmidt, team co-owner of the Verizon IndyCar Series’ Schmidt Peterson Motorsports.